In 2017 39% of 12th graders reported they experienced "loneliness". In 2012 it was only 26%. In 2017, teens got together with friends 68 fewer times a year than they did in the early 1990s and high school seniors went out on dates 32 fewer times a year. A Carey Nieuwhof podcast recently compare Social Media to a less-than-desirable daily activity... Remember how awkward the school lunch room was? Outcasts sit in seats while popular kids run amuck? A teen quietly walks from table to table, looking for a table where she won't be judged, ridiculed, or ignored. Unfortunately, Social Media to the teenager is basically the school lunchroom 24-7-365. Technology can create environments of isolation. How does this impact the Church? While some would say this is the reason why Church Online is not healthy, I would argue that this is the exact reason Church Online is needed... assuming you answer this one question correctly. Why Are We Doing Church Online? If the endgame of Church Online is to create a self-contained religious ecosystem, I give pause, as I believe Church Online self-contained creates isolation. DJ Soto was a pioneer in this area by creating VR Church, a church environment completely reimagined utilizing VR technology. All aspects of the church exist in the virtual realm. I've talked with DJ about his specific church, and how to battle church-in-isolation. I went in a doubter, a critic of the idea. I walked away believer in the idea, because of one caveat. VR Church preaches the idea of connecting the Gospel in the physical realm. DJ's intentionality, however, is not covered by many Churches who operate a Church Online. The absence of a Biblical Community, or a Discipleship Pathway, is scary. Church, our aim should be to foster community, digitally and physically. Our churches, whether physical or digital, need to create interaction in the physical realm. Remember that Online to Offline, simply put, is utilizing our Online relationships to impact our Offline world. Truthfully, the digital life can be lonely, especially if it's the only life that we have. In today's culture, Church Online cannot exist in isolation. Even the best intentioned digital ministries can be hurtful if we are not focused on impacting our attenders on the importance of the physical space. 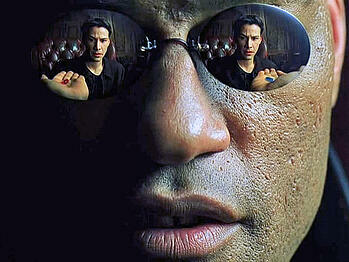 Morpheus was right. Humans cannot live in a digital world only. We need physical interaction. Similarly, Biblical Community can and does happen in digital spaces, but this community is not self-sufficient. Humans need physical interaction to separate from loneliness or isolation. This begs the question: What does someone do for physical community if none of their physical relationships knows Christ? Church, our Online Communities aim should be to impact the digital realm, but also resource our digital attenders with the Gospel for the physical realm. We must empower our digital attender with the understanding that the spiritual life exists physically, not just virtually. James 1:22 - Do not merely listen to the word [ONLINE], and so deceive yourselves. Do what it says [IN THE PHYSICAL WORLD]. There's a larger aim that the Church needs to realize in context of Church Online. As we're discovering through the USA Today article, digital communities alone are not healthy. Self-contained communities, in online context, can cause isolation (especially if physical community isn't available). Church, let's use the strength of Online Technologies to create community, but use these communities to impact the physical realm. What if we encouraged our Church Online to not create self-contained, self-focused Biblical Communities, but instead discipled these people to reach into their physical environment with the Gospel? Have we not just created a disciple of Jesus? Matthew 28:19 & 20 - Therefore go and make disciples of all nations, baptizing them in the name of the Father and of the Son and of the Holy Spirit, and teaching them to obey everything I have commanded you. Church, maybe it's time to re-aim our Church Online. Are we unintentionally creating church-in-isolation? Or are we creating environments that will make disciples?